Sharda University Invites Apple Inc. & Leading Media Houses to Offer Free Industrial Training to Students! Summer Internships offering innovative programs are a unique concept. Inspired by the concept of Summer Schools in leading global universities like Harvard University and Stanford University, these programs address the dual purposes of learning and skill development. Offering a slice of life outside of campus, they help students make an informed career choice. At Sharda, we believe that practice is equally important to theory. The importance of personality development through polishing communicative skills cannot be ignored. The industry-relevant skill training by prodigies of the field gives maximum exposure to the candidates. Sharda University is fully abreast with the latest techniques adopted by leading universities across the world. Leveraging on its policy to Go Global, Sharda University offers Skill Development Summer Certification Programs in collaboration with Apple Inc. The enrolled students will get bright industry exposure by teaming up with media partners like Discovery channel, The Hindu, NDTV Goodtimes, IBN7, Zee TV, Sony Entertainment Television, ABP News, and Hindustan Times. The collaboration with reputed brands offers the students a unique opportunity to learn firsthand directly from the experts. The internship will offer a bouquet of short-term certificate programs in digital interest areas like Social Media Marketing, Data Analytics, Internet Security, Project Management, and more. Other facets of the programme will train students in Radio Jockeying, Script Writing, Cinema Appreciation, Cinematography, Video Editing, Digital Media Marketing and Graphics & Animation. The course is designed by experts for fast track learning and is focused on practical exposure. Any candidate with interest in the offered areas is eligible to join the internship. 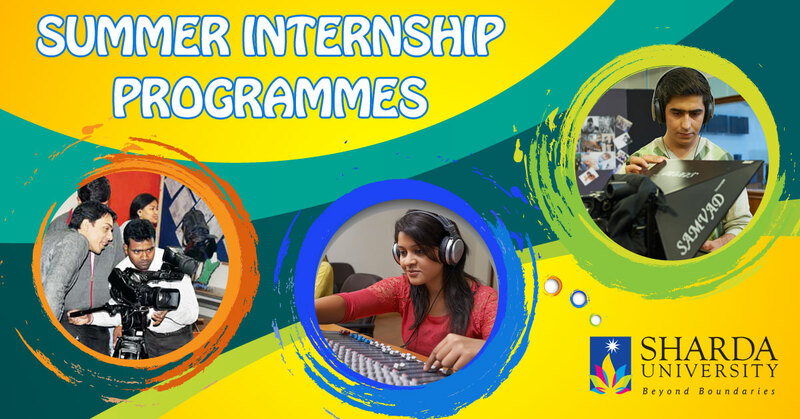 Summer certification programs in Media are a promising endeavor of Department of Mass Communication, Sharda University. The innovative program will enable the candidates an experience to explore the horizon of opportunities through insightful practical learning techniques that invoke a path of self-discovery among students.